Pleistocene Age glaciers advanced and retreated many times over the past 1.8 million years, dramatically carving and shaping the mountains surrounding Alpine City. They retreated for the last time about 12,000 years ago, leaving their traces in sharp ridgelines of horns, smooth cirques and moraines on and below Lone Peak, Box Elder Peak and White Baldy. The glaciers that originated on the highest peaks reached their maximum extent around 17,000 years ago. 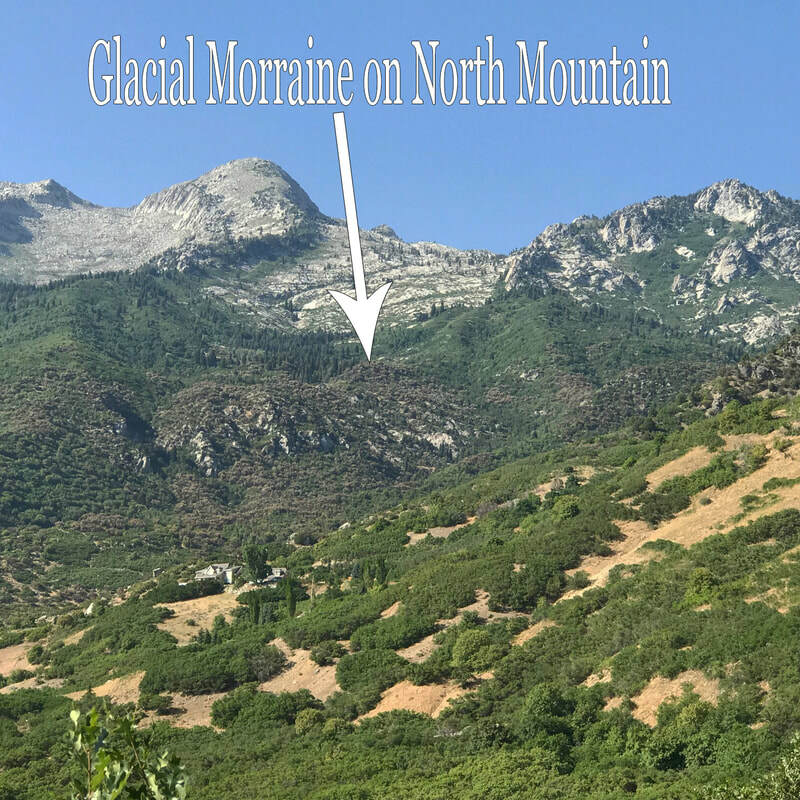 The icy tongue of the glacier that carved out Dry Creek Canyon bulldozed granite boulders and glacial till into Alpine, reaching at one point into the lower part of the Alpine Cove Subdivision in the northwest part of the city. The illustration shows the maximum extent of glacial ice coinciding with ancient Lake Bonneville at its maximum depth. Increasing precipitation and cooler temperatures were responsible for creating the Ice Age and during this time, Lake Bonneville filled as meltwater poured off the glaciers. The highest lake levels were controlled by bedrock dams near the Utah-Idaho border. The lake level filled up to the spill point of the natural dams; the overflowing water then cut into the bedrock and lowered the lake level multiple times throughout its history. These different lake levels (or ancient shorelines) are preserved as benches on the steep mountain front around the valley. About 12,000 years ago, temperatures began to rise and precipitation decreased in this part of Utah. As a result, Lake Bonneville began to dry up and shrink in size, leaving its shorelines carved high above the valley floor. The Great Salt Lake is all that remains, an evaporative, salty remnant of the once great fresh water lake that covered nearly one-third of the state. ​Major earthquakes on the Wasatch Fault, on the north and east sides of Alpine, have since bisected some of these shoreline benches. The most recent large earthquake, with a magnitude of possibly 7.5 on the Richter Scale, occurred about 300 years ago. Special thanks to geologist and Alpine resident, Mike Russon, who researched and contributed this article.